If you have 1 or less card on the field, the ATK of this card on the field is increased by 400 points. Also, if this card is the only monster on your side of the field, negate the effects of Flip Effe..
As long as at leat 1 monster exists on your side of the field, your opponent cannot select this card as an attack target. Also, as long as this card remains face-up on the field, increase the ATK of W..
You cannot declare an attack without offering 1 monster on your side of the field as a Tribute. 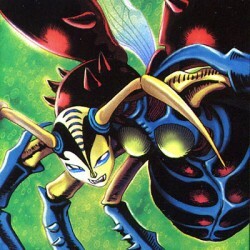 Increase the ATK of this card by 200 points for each face-up Insect-Type monster on the field. Spevial S.. This card is changed to Defense Position when it is Normal Summoned or Flip Summoned successfully. This card can only attack while it is in Defense Position. If this card attacks while in Defense Posi..